Labor provisions in free trade agreements take into consideration any standard which addresses labor relations or minimum working terms or conditions, mechanisms for monitoring or promoting compliance, and/or a framework for cooperation. (See appendix: evolution of labor provisions in US free trade agreements). As of December 2015, there were 76 trade agreements in place (covering 135 economies) that include labor provisions, nearly half of which came into existence after 2008. This represents more than one-quarter (28 percent) of the trade agreements which the World Trade Organization (WTO) has been notified of, and which are currently in force. Over 80 percent of agreements that came into force since 2013 contain such provisions. Countries most active in promoting labor provisions in free trade agreements include: Canada, the European Union, the United States, Chile, New Zealand and Switzerland. Some South-South free trade agreements also include labor provisions. The study finds that there is NO evidence to support the claim that implementation and enforcement of labor standards leads to reduced trade. The findings show that trade agreements, with or without labor provisions, boost trade between members of the agreement to a similar extent. For country-partner pairs that have a trade agreement with labor provisions in force, bilateral trade is estimated to be on average 28 percent greater than what would be expected without such an agreement. Results further show that, on average, trade agreements that contain labor provisions impact positively on labor force participation rates, bringing larger proportions of male and female working-age populations into the labor force and, particularly, increasing the female labor force. The study assumes that labor provisions in trade agreements can raise people’s expectations of better working conditions, which in turn increases their willingness to enter the labor force. However, the study found NO statistically significant relationship between labor provisions and labor market outcomes such as wages, share of vulnerable employment or gender gaps at the aggregate level (i.e. consider all countries). On the one hand, this implies that labor provisions at least do not lead to the deterioration of other labor standards in a country. On the other hand, it indicates that labor provisions in free trade agreements have limited impact on the outcomes of the labor market. Additionally, the study stresses that interaction among stakeholders, capacity-building and monitoring mechanisms – with the support of social dialogue are critical to achieve positive outcomes in the labor market. In a case study on the Cambodia–US Textile Agreement specifically, the report finds strong firm-level intervention, such as monitoring and compliance, improved wages at the firm level, including a notable reduction of the gender wage gap. In another case study, it is found that capacity-building measures brought to Bangladesh after the Rana Plaza tragedy have resulted in some visible improvements with respect to the number of trade unions, building safety and amendments in labor law in the country. This brief summary of the labor provision study examines just how effective improved labor provisions are within trade agreements. Now more than ever, labor conditions should be improved to encourage socially responsible retailers to participate in sourcing from locations with high labor standards. Since labor provisions do not have significant impacts on market outcomes as stated in this post, there should be further analysis to see what factors play parts in these improvements. I’m a little sad that labor provisions haven’t led to better market outcomes–however, they have increased the female labor force! 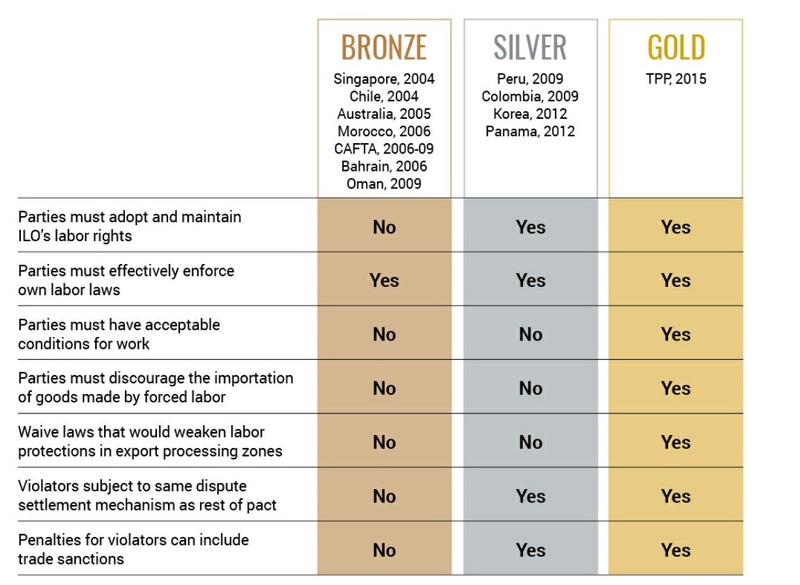 I believe TPP has advanced a lot by having a Gold-level in labor provisions. This is great; it may not be a complete game changer for retailers when establishing sourcing bases but it is definitely a beginning to lead other labor provision charges. After incidents like Rana Plaza, it’s extremely important that businesses discuss labor environments; I believe it will pick up urgency as more FTAs are adjusted for improved settings. 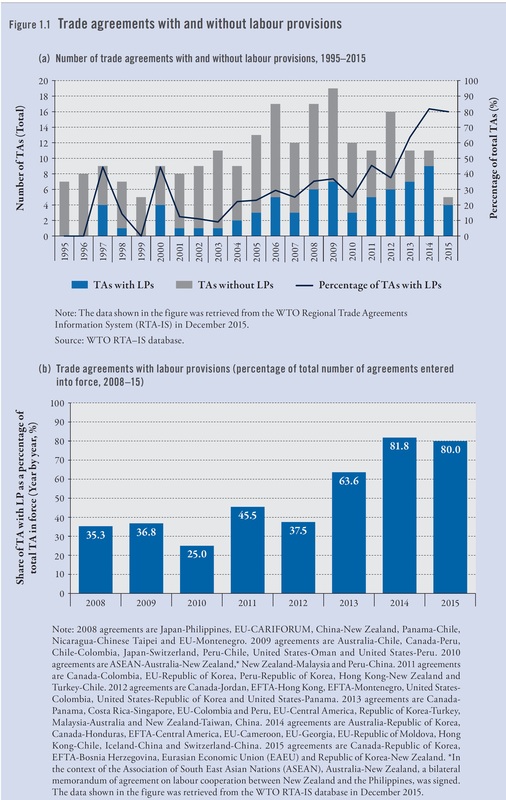 Improved labor provisions in trade agreements are effective. This is because by having a positive impact on labor force provision rates, helps increase male and female labor forces and especially among women. Interactions with stakeholders are necessary to obtain desired outcomes in the labor market. There has been many “accidents”/”crisis’s” relating to labor/labor environments. The more we become aware of these crisis’s and are more informed on corrective measures for them the safer the labor environment will be. I like how this article touches upon the recent spike in labor provisions in the last few years. Labor provisions are critical to keeping the fashion industry safe and running smoothly so its nice to read about how much the fashion industry has implemented this idea since 2008. It was cool to read that these labor provisions are empowering workers to join unions, which shows that they are not only protecting workers but making them feel more comfortable and in charge in the work place. Labor provisions and agreements also benefit the owners of the companies as well because trading actually is said to have increased post-agreement. With this being said, the world as a whole still has a long way to go in order to protect garment workers, particularly those in developing countries that need the money desperately. However, the ball is definitely rolling in the right direction to establish better working environments. If effectiveness is to be achieved then improved labor provisions within trade agreements must occur. Labor provisions in free trade agreements take into consideration any standard which addresses labor relations or minimum working terms or conditions, mechanisms for monitoring or promoting compliance, and/or a framework for cooperation. I found it most interesting that results of the study show on average that trade agreements that contain labor provisions impact positively on labor force participation rates. The study shared how they bring larger proportions of male and female working-age populations into the labor force and, particularly, increasing the female labor force. It is so fascinating that the study assumes that labor provisions in trade agreements can raise people’s expectations of better working conditions, which in turn increases their willingness to enter the labor force.